RAMAC (which stood for random access method of accounting and control) was the world's first computer disk storage system. 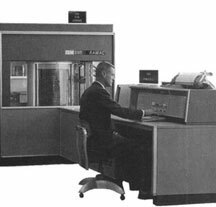 Developed by IBM engineers in San Jose and introduced in 1957, RAMAC was marketed as a business machine for accounting applications. Prior to RAMAC, computer storage was largely reliant on magnetic tape. RAMAC's disk-based storage introduced moveable read/write heads, which enabled a semi-random access capability. This ability was a momentous achievement, both for IBM and for the computing world in general, because fast random access to large volumes of data now made it practical to have interactive computer systems. RAMAC's development also led to IBM opening its first storage manufacturing plant. As part of the IBM 350, RAMAC was a system that used fifty metallic disks coated on each side with a magnetic iron oxide. The coating was a variation of the paint primer used on the Golden Gate Bridge. The disks, which were two feet in diameter, were arranged on a rotating spindle. Data was recorded on both sides of the disks, each holding a hundred concentric tracks, for a storage capacity of 5 megabytes. An access arm under servo control moved two read/write heads to access to any of the tracks. Originally, RAMAC's purchase price worked out to about $10,000 per megabyte of storage capacity. By 1997, the price per megabyte had dropped to about ten cents. The system you see above includes the hard disk, a card reader, a CPU and a printer. It weighed over a ton. ZDnet has a short video clip of a RAMAC in action. This EDN article is called "Milestones That Mattered: RAMAC launched disk-drive revolution." Newsweek columnist Steven Levy writes about "The Hard Disk That Changed the World." George Rostky provides a look back at the history of the disk drive. IBM Research provides more information about RAMAC in its "History of IBM Research 1945-1996."